Dispose of your unused, unwanted, and or expired medication at one of these Disposal sites. Monday 9-5 p.m., Tuesday 9-7:30 p.m., and Wednesday-Fridays 9-5 p.m. Every second and fourth Mondays are open from 9-10 p.m. It is closed weekends. If you are interested in having a permanent prescription drop box in your local community police department please contact Brian Wilson at Bwilson@atlprev.org or 609-272-0100. 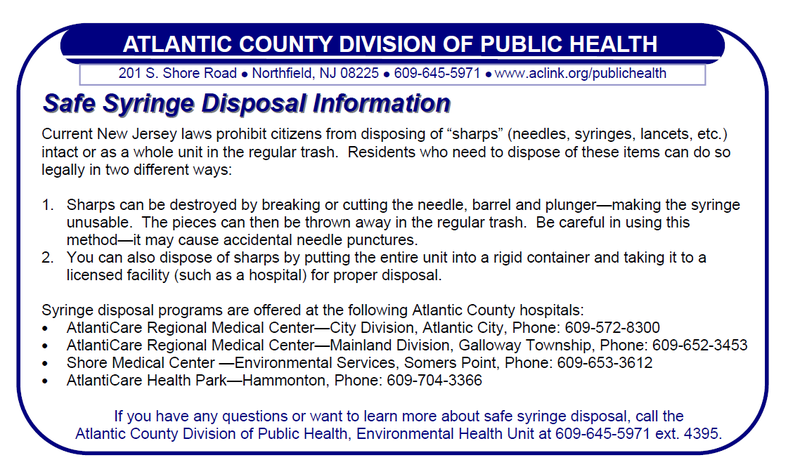 You may also dispose of sharps/needles during a Hope One event. Schedule is listed below. For additional information please visit www.hopeoneac.com or call ​609-909-7200. This website was developed in part under a grant number SP019814-01 from the Office of National Drug Control Policy and Substance Abuse and Mental Health Services Administration, U.S. Department of Health and Human Services. The views, policies and opinions expressed are those of the authors and do not necessarily reflect those of ONDCP, SAMHSA or HHS. Contact JTACNJ@atlprev.org for more information.